This year saw mid-century buildings across North America undergo impressive revamps. For our 2017 review, US reporter Eleanor Gibson has selected 10 of the best, including a refreshed Eichler house, a 1950s motel transformed into a Japanese-style retreat and a retro lodge. 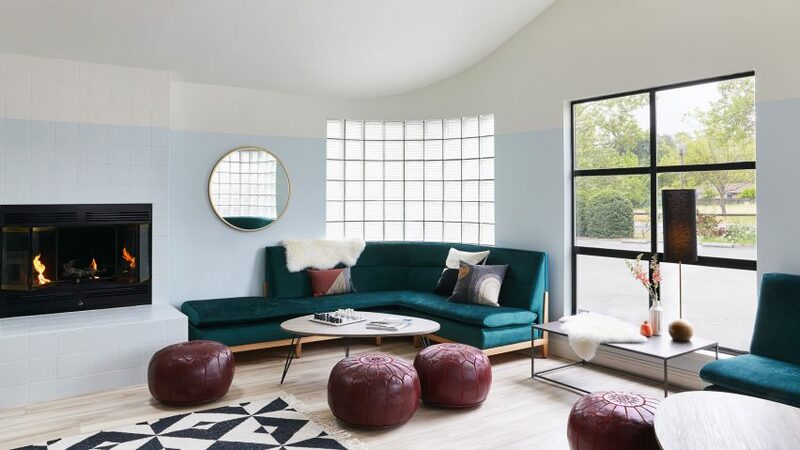 US design firm AvroKO mixed aesthetics from the 1950s, 60s and 70s when styling this mid-century motor lodge in California's Napa Valley, giving each space a different feel. Amenities include a retro living room, which has portions of glass-block walls, and teal and burgundy seating. The beach-house-like spa waiting room combines graphic red floor tiles, white-painted wall panelling and comfy grey armchairs. This 1960s house in San Francisco is known as an Eichler, as it forms one of thousands built by Joseph Eichler – the post-war real estate developer recognised for bringing modernist housing subdivisions to America. Inside, its existing post-and-beam structure and ceiling panels are refreshed with paint, and complemented by mid-century-style details like mahogany wall panels. Other interventions include glazed sliding doors that open onto a terrace and a concrete-block chimney. Architect Andrea Lenardin Madden was tasked with overhauling and extending a neglected, landmarked residence built by midcentury-modern architect Rodney Walker in Los Angeles' elite Bel Air neighbourhood. Aiming to give a "contemporary feel", her two-storey addition comprises a cantilevered angular volume on top with floor-to-ceiling glass that offers views of the hills surrounding. The 49-room Anvil Hotel in Wyoming occupies a series of structures built in the 1950s as a motel. Now a cosy, boutique retreat, it features a wood-burning stove and an Italian restaurant with wood-panelled and dark green walls. Bedrooms and bathrooms have similarly dark finishes, following this year's trend for moody interiors. Rather than mirroring the style of the existing low-lying Austin ranch house, this offset stack of white volumes at the back provides quite the contrast. The tower houses a sitting area, two offices, a reading room and a play loft, which adjoin the kitchen and living room inside the old property via platforms. The pitched roof of this 1940s bungalow was lifted to make a flat plain with exposed wooden structural joists, matching the frames of the new clerestory windows, which bring in plenty of daylight. Designed for a local newspaper editor and a filmmaker, the project also involved stripping out walls to form an open-plan living, kitchen and dining room. With its low-lying form, large expanses of glazing and open-plan interiors, this residence in New York's Hudson Valley looks as if it were built in the middle of the 20th century. But these features were actually added recently by New Jersey architect Jeff Jordan to provide its residents with a better connection between living areas and the outdoors. Tatami mats, sand-coloured limestone walls and wooden soaking tubs are among the Japanese-style decorations in this oceanside hotel in Malibu, formerly a 1950s motel. The high-end retreat is the first in Japanese restaurant chain Nobu's Ryokan series. It includes 16 bedrooms, some with beach views and others overlooking a courtyard. Located in Toronto, this mid-century modern house was extended and renovated for a family of five. Interventions are subtle, including a small addition and another on top, leaving the existing form of the overhanging roof and white brickwork walls visible. Finishes inside are intended to match this aesthetic, like a variety of wood for the ceiling, floors and furniture, and greyed walls. Terazzo flooring and exposed concrete are offset by glossy yellow kitchen cabinets, colourful furniture and patterned rugs in the suites at Hotel Valley Ho – an iconic mid-century hotel in Scottsdale, Arizona. This renovation is the latest in a string of adaptations to the hotel, which first opened in 1956 in a two-storey complex designed by modernist architect Edward L Varney.